The city of Nashville, Tennessee has always been better known as a center of Country music. But it also has a rich heritage in Blues and Soul, and a lot of the current day crop of musicians, such as Roscoe Shelton and Earl Gaines, are finally getting their due recognition. Producer / guitarist Fred James is responsible for bringing out many of these legends of the past, securing both recording contracts and festival tours for them. 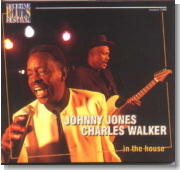 One such trip to the Lucerne Blues Festival in Switzerland has resulted in a very fine live album, In The House (CrossCut Records), for guitarist Johnny Jones and standup singer Charles Walker. James' band backs up these two gentleman, who share the vocals on the dozen cuts here. Walker is, simply put, a fantastic soulful singer, especially on the slow pleading number "Slave To Love," the blues shuffle "Chicken Scratch," and the slow blues "Storming And Raining Blues." Jones, who backed played on many classic Nashville soul sessions in the '50s and '60s, shows both his nice, smooth voice and his guitar prowess on the shuffle tune "The Drifter" and the slow, B.B.-style blues "Can I Get An Amen." An extra treat on In The House is the consistently wonderful B3 playing of Billy Earheart. This CD, while possibly hard to fine, is HIGHLY recommended. Too often in the blues world today we focus on the hottest new guitar player to come along. What is often overlooked is the power of the world's oldest instrument, the human voice. Great singers just aren't given their due respect. A powerful voice can evoke emotions from the listener that an instrument just can't do most times. 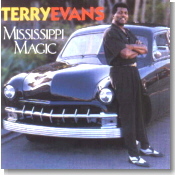 One such voice belongs to Terry Evans, who is best known as one of Ry Cooder's often-used backup vocalists. Evans has one of those charcoal rich voices that you never tire of hearing. His latest, Mississippi Magic (Audioquest Music), is one of the best albums I've heard this year. Don't be expecting straight blues, as there's a wide range of music styles covered here. But everything's got a real deep South feel, heavy on the soul and gospel influences. The highlights here include the stark, soulful "I'd Rather Trick My Own Self," with good harmonica accompaniment from Juke Logan, the spirited gospel-sounding "Don't Let The Green Grass Fool You," with great sax from David Woodford, and the rawer blues shuffle "Blues & Wine," with harmony vocals from Evans, Willie Green Jr. and Ray Williams. But the best is saved for last, as the album closes with powerful shouting blues vocals from Evans and good slide guitar from Jesse Samsel on "Where We Gonna Go." Another fine release from an artist who just keeps getting better. East Coast blues guitarist Terry Garland is back with another pleasant acoustic effort, The One To Blame (Planetary Records). As on previous albums, he's joined by his pal Mark Wenner, the regular harmonica player for the Nighthawks. Garland plays both National and acoustic guitar. He's obviously listened to a lot of old blues records and has learned his lessons well. Of the original compositions, one of my favorites is the haunting blues The One To Blame, with very nice guitar work. Wenner gets to show off his harp skills on the Champion Jack Dupree number "Nasty Boogie Woogie." An absolute keeper is the version of the traditional gospel tune "A Closer Walk With Thee," made unique by the trombone of Rich Moncure and muted trumpet from Dave Tripplet. But the most stirring song here is the slow blues original "When A Brother Dies," which carries so much emotion that you wonder about whom Garland wrote this one. The One To Blame is certainly one to find for lovers of traditional music. Steak (Antone's Records), from Texas-based singer / harmonica player Guy Forsyth, is billed as "Rockin' American Blues." I'm not sure that rockin' is the right term to use, as the music here is usually a little deep and foreboding for that description. Muddy Waters' "Lousiana Blues," Willie Dixon's "My Love Will Never Die" and Forsyth's "Good Time Man" are about as dark as a song can get. "Thibodaux Furlough" is another original which could easily have come from the Tom Waits songbook, made eerie by the sound of a Stanley saw and various other sound effects. "You're Still Here" is a heavy harmonica song that moves along like the musicians were carrying 500 pound weights on their backs. Then Forsyth turns around with a lighter jug band sound on "Adam's Rib," with Steve James on 6-string trench broom banjo and Stan Smith on clarinet. Okay, if you want to hear a rockin' number, then don't miss the uptempo jumpin' shuffle "Makin' Money." I love this CD more and more each time I hear it ... I just don't think that "rockin'" is an apt description. It's got too much swamp water and mojo in it ... and that's all for the better. I'll instead just classify it as fun American blues. Ebb Records was only in business for three years (1957-1959), but issued a lot of fine blues and soul recordings during that time. Many of the 29 cuts on The Ebb Records Story, Vol. 2 (Specialty) now sound a bit dated, although others are as fresh as anything being recorded today. I can never get enough Professor Longhair, and there are four cuts from the New Orleans piano genius ("Baby Let Me Hold Your Hand," "Looka, No Hair," "Baby Let Me Hold Your Hand" and "Misery," the latter sounding a lot like the Fess' better-known "Tipitina). Ted Taylor, also represented on four numbers here, was an incredible soul singer. But his best contribution is the blues number "If I Don't See You Again." Pianist Floyd Dixon has only one song, but it's a great one, the slow blues "What Is Life Without A Home." The song that really grabbed me was the astounding version of "Harlem Nocturne" by J.J. Jones. This sax instrumental is usually played at a dirge-like pace, but Jones gives it a little more zest. The Ebb Records Story, Vol. 2 is not an essential purchase, but a good period piece for collectors, especially for that version of "Harlem Nocturne." 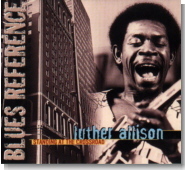 Standing At The Crossroad (Blues Reference) from Luther Allison an album originally recorded in Paris, France in December 1977 and titled Love Me Papa. But it now has been digitally re-mastered and released on CD by Blues Reference. What a shame that this couldn't have been done while Luther Allison was still alive! The CD opens with what was the title track to the original album, the sentimental "Love Me Papa," the lyrics of which are a little slushy for me --- but the music is good and the lyrics a matter of taste. However, once past the first track, I couldn't help but love the rest --- a mixture of different tempos and flavors. There are two versions each of "Goin' Down" and "Feelin' So Good," which seems a bit like the record company was trying to fill space. But there are some big differences in the takes and the end result is that I certainly didn't mind listening to the different versions. It wouldn't stop me from buying this CD. Luther was certainly his own man, but he lets some great influences show through --- from my perspective Freddy King, Elmore James and Hound Dog Taylor shine the strongest and I love it. Sid Wingfield provides some absolutely high-quality backing on piano and organ, especially on "Goin' Down," Luther's Boogie" and "Feelin' So Good." Jim Campbell's bass riffs are so good that I'm left wondering why we don't hear more of this guy. The CD cover is in French, as well as English, I guess because France is where Luther really made his mark on European audiences in the mid 1970s. Buy this CD, listen to it through some good quality headphones, and play the last two tracks over and over again --- these are the alternative takes of "Goin' Down" and "Feelin' So Good," previously unissued, and they really cook! As a personal preference I like to listen to blues albums that have been recorded live, and very now and then a live album comes along that is so full of atmosphere that you can almost imagine that you are at the gig. Live Bootleg (Arvey) from West Side Heat is one of those albums --- listen to it with headphones on and the lights turned down and you are sitting in The Hot Spot at Fort Wayne, Indiana where it was recorded. I just wish that I had actually been there. Chicago based West Side Heat is Steve Arvey (on lead guitar and vocals), Mark Hoekstra (harmonica, slide guitar and vocals), Kevin Johnson (drums), and Tim Logan (bass guitar & vocals) - the same basic line-up that Steve Arvey used for his excellent "It's A Fine Line" CD. No Need to change a band that works so well together. The band opens up the album with "It's My Soul," a great showcase for Hoekstra's harmonica, and a track that gets the audience on their side straightaway, before launching into "Coming Back To You" with Hoekstra blowing up a storm again. Track four, "Love Light," shows each band member's talent to the full extent. If drums are your thing, then this CD is worth buying for Kevin Johnson's drum work on this track alone --- listen to it and you'll just know that the audience that night are in full agreement! As well as the tracks that I've already mentioned, there is a lovely version of James Oden's "Going Down Slow," which lasts almost nine minutes --- magic stuff !! To add a touch of something different, the band also included their version of the Rolling Stones number "You Can't Always get What you Want," and the CD closes with a 21-minute medley of "Not Fade Away, Space & Voodoo Child" - these are not my personal favourites on the CD, but the audience on the night obviously enjoyed them and they definitely deserve inclusion on the album. Criticisms? Well, none at all, as far as the music is concerned. But the CD cover could have given a bit more information --- no mention of recording date, or who wrote the tracks, or track lengths. However, it is marketed as Live Bootleg and traditionally bootleg albums were always a bit lacking in information. There are many sides to Curtis Salgado. With the release of his fifth solo album, Soul Activated (Shanachie), he isn't afraid to let you see all of them. One of the most emotionally stimulating singers out there today delivers a powerful album deeply rooted in the tradition of Hi Records. Salgado branches into several different styles such as rockabillly, classic R&B, funk, soul and naturally, of course, the blues. Curtis possesses the remarkable gift of being able to take any style of music and manipulate it into something completely his own with a fresh direction that usually hasn't been tried before in the blues. A prime example of this is his cover of Jimmy Cliff's "The Harder They Come," which will blow your doors off. Now, if you're expecting any type of reggae to be mixed into this classic reggae tune, forget it. What you will find with this number is a high energy piece of Memphis based R&B, driven and fueled by the velvety smoothness of The Memphis Horns, who are also on board for two other numbers. The original "Funny Man" however is where you will find plenty of reggae inflections. Blue-eyed soul is on the bill with a cover of Hall And Oates' "Everytime You Go" that puts the original to absolute shame, and a rambunctious honky tonk version of Leon Russell's "I'd Rather Be Blind" rocks the house. LouAnn Barton duets with Curtis for a rousing version of the rockabilly nugget "Hip Hip Baby," with Jimmie Vaughn adding his guitar magic to it and two other numbers. The one instrumental tune to be found is "Lip Whippin'" a seven minute harmonica blowdown that also features guitarist Loyd Jones adding some very hot licks. If there is a downside to this very admirable album it's the fact that, other than "Lip Whippin'" and "Portable Man," Salgado's harp work is absent for the remainder of the album, which is a severe loss in my opinion as Curtis is quite the accomplished harp player. After stints with Robert Cray, Roomful Of Blues and Steve Miller, it's about time this fantastic musician and singer is given his just due. Why he has not exploded like a super nova on a more national level I find hard to fathom. Perhaps Soul Activated will be the album that will finally turn that corner for him. Be sure to hear this one. About a year ago Telarc brought together four masters of the Mississippi saxophone for one red hot harmonica album. The name of the album was Superharps, reviewed in Blues Bytes December 1999. At the time of it's release I had thought the definitive harp album had been made, with any subsequent projects of the same nature being hard pressed to eclipse it. What I didn't know was that the good folks at Telarc had planned to do a sequel. Superharps II is another blistering hot harp summit, this time featuring the elegant talents of Carey Bell, Snooky Pryor, Raful Neal and Lazy Lester. Superharps II follows much in the same vein of its predecessor, with each artist fronting a number or two on his own before pairing off in various combinations, with all four joining together for the final freestyle jam entitled "Harp To Harp." This time out, however, there is a certain Chicago meets country blues sound, topped with a wee bit of Memphis as icing on the cake. Carey Bell starts things off with his rendition of Muddy Waters' "Walking Thru The Park" and teams with Snooky Pryor for a scorching version of "She's Nineteen Years Old." Pryor himself offers new versions of a pair of his original tunes, "Let Your Hair Down" and "Shake My Hand," with Lazy Lester filling in nicely for the second solo. Lester contributes a barrelhouse version of "I Hear You Knockin'," and "Blood Stains On The Wall" finds him on both harp and acoustic guitar with Snooky playing backup and fills. Raful Neal's contributions of his own works, "I Miss You Baby" along with "Starlight Diamond," are two of the album's brightest spots, featuring his smoky vocals and bayou-flavored harp licks. Backing this lineup of harp giants is the same stellar lineup from Superharps I. Twanging out the guitar line is the often under appreciated Kid Bangham, Anthony Geraci pounds away on the black and whites, Michael 'Mudcat' Ward thumps the upright bass and the superior stick and brush work of Per Hanson completes a very tight quartet. Back again in the producer's seat is Randy Labbe, coupled with Telarc's continuing commitment to pure digital mastering to give this recording an impeccable depth in both clarity and performance. Superharps II is a delightful blend of four very distinguished talents coming together to celebrate a truly American idiom ... the blues. For those of you who enjoyed the first Superharps, you're gonna love this one. Put this high on your "gotta have it" list. It was only a matter of time before one of the major labels snapped up the very gifted guitar and vocal talents of Rusty Zinn. Alligator Records was the label with the good fortune to sign him and release his third album, The Chill. Mentored by the great Luther Tucker and having either recorded or performed with names such as Kim Wilson, Pinetop Perkins, Jimmy Rogers, Snooky Pryor and Mark Hummel, Rusty emerges on this release as a very confident singer with some strong songwriting potential. The only reason I say 'potential' is because, of the five originals credited to him, only one, the shuffling "Drinking My Last Dime," is solely written by Zinn. Not to take away anything from his co-writer Rick Estrin (Little Charlie and The Nightcats) on the other four, but I was looking forward to seeing into what kind of songwriter Zinn was developing. Besides that, The Chill is a damn good album showcasing the many stylistic variances that Rusty possesses in his repertoire along with some strong expressive vocals. This guy can play just about everything under the sun. "She's Got Style" and the album's closer, Johnny "Guitar" Watson's "Looking Back," both bounce to a classic 50s rock and roll beat ideal for a turn or two on the dance floor. A cover of Luther Tucker's "Fallin' Rain" is a slow blues tribute to his mentor that features some of Rusty's most passionate picking and vocals on this album. A few hard-edged emotions are apparent on the remorseful "I Played The Game" that finds touring band mate Bob Welsh's piano at the forefront along with some screeching soloing from Zinn. The title number is also a departure from the relaxed atmosphere of the rest of the disc with Rusty again ripping off some blazing runs up and down the fretboard with his trademark double-picking style against a mellow backdrop of the sweet organ impressions of Jimmy Pugh. "Moonlight Blues" has a slow funk to it that is aided by the lovely slide guitar courtesy of Elvin Bishop. This album was co-produced by Rusty and Alligator chief Bruce Iglauer with one of the best engineers in the business, Jerry Hall, aboard to give this recording an old time vintage sound that is showing up in more and more blues recordings and works perfectly here. With this release Rusty Zinn shows a more mature confidence that was not as evident in his last two efforts. The Chill is a very upbeat, happy album that has a consistent flow throughout its 12 tunes that you will hear something new upon repeated plays. At only 30 years of age this guy is going to be around making great music for a very long time to come. Experience the heat of The Chill for yourself. The Racky Thomas Band comes from Boston, and they have put out three self-released CDs. Last of the Big Spenders was released in 1998 and is their second CD, a great collection of some old time blues. The songs on this CD are very diverse and just a whole lot of fun to listen to and, no matter what style they decide to play, they pull it off. The CD starts off with a bang with "Sweet Dough Baker," a great old time blues song with very nicely played guitar by Nick Adams and vocals by Racky, who also plays harmonica. The next track, "Don't Treat Me Like That," picks up right where "Sweet Dough Baker" left off, but with more of a sly feeling to it. The next couple of songs are very solid and well played, with "Rack'em Up" a great instrumental showcase for Racky's harp playing. "Last of the Big Time Spenders" is a very solid straight ahead blues song, and it sounds new and refreshing. Track eight, "Tears Fell Down Like Rain," is the best song, and it is unlike anything else on the CD as it is a ballad about a relationship that did not work out that well. This CD is very much worth getting. You can find it at cdfreedom.com, where you can find Racky's other CDs. It is well worth the search. Troubled All The Time is Racky's newest CD, released in 2000. This CD is even more diverse than Last of the Big Spenders ... it even includes a semi-bluegrass song in "All I Need Is You." The CD also starts off with a barn burner in "Ain't It Lonesome," classic sounding Chicago blues with great harp work by Racky. The next song is also a very rousing one with a very swing/jump feel, enhanced by backup vocals by the group.This song also has some great horn work by Doug James and "Sax" Gordon Beadle. Track five, "Blues Keep Me Troubled," is a very good and solid song, while "Your Love to Me" is one of the standout songs on this CD. It is another ballad that is powered by the saxophones of James and Beadle. "She Ain't Your Average Ordinary Dame" is a very rocking old time jump blues song that is done justice by Racky's powerful voice. The closer on the CD is a version of the traditional "John the Revelator" that has Racky showing off his vocal talents unaccompanied. This CD is just as good as Last of the Big Spenders, and is also available at www.cdfreedom.com. In their own way, The Nighthawks are legends too. Founded in 1972 by harpist and vocalist Mark Wenner and guitarist Jimmy Thackery (who went solo in 1986), this Washington, D.C. combo has kept a remarkably stable core unit of Wenner, drummer Pete Ragusa and bassist Jan Zukowski (both of whom joined in 1974) for close to 30 years. Purists tend to overlook bar bands such as this group. But for all their predictable covers and rough and tumble approach, The Nighthawks have gained through the years a healthy respect and recognition. John Hammond Jr. recorded one of his best ever albums, Hot Tracks, with the Thackery-era Nighthawks as his backing band. (For a taste of this collaboration, check out Hammond's Best of the Vanguard Years, which came out last year.) Their live shows are their strength, as is to be expected. But on their infrequent studio recordings the Nighthawks always seem to strike the right balance of Chicago-style swagger, soulful delivery, rock and roll energy and plain fun. Originally recorded in 1991 for the hard-to-find Powerhouse/Ichiban, Trouble has just been reissued, with new liner notes by Mark Wenner and slightly altered cover art, on the Ruf label from Germany. Apart from drummer Ragusa handling vocals on two tracks and guitarist Danny Morris singing lead on another, Wenner is the featured front man. With so many years together on the road, you've got to figure that the band dynamics are in place, and indeed they are. Everyone knows his job and does it extremely well, from the stellar rhythm unit to the harmonica and guitar solos (guest Bob Margolin taking a few). What makes Trouble stand above most of the rest of the Nighthawks' studio output is its better song selection. Though there are only two originals, for the most part the covers are not of the overdone category. (The sole exception is Leiber and Stoller's "The Chicken and the Hawk," which sounds stiff compared to other, more full-of-jump versions.) Blues, Chicago and Texas style, but also R&B and jump blues, early rock and roll and a rarely covered Dylan song from Blonde on Blonde, "Most Likely You'll Go Your Way and I'll Go Mine," can be enjoyed here. The title track is not the only Elvis Presley cover. There is also a cool twangy doo-wop version of "Tryin' to Get to You." (A note: Elvis had heard this last tune from a Washington, D.C. vocal group called The Eagles. Is it possible that the Nighthawks know this version as well as the better-known Presley take?) Also of interest (but far from the best track on the album) is the song "One Rock at a Time" (co-written by Wynans, Layton and Shannon), which pre-dates the "original" version from the 1994 Storyville debut. Since Trouble's initial release, the Nighthawks have released two albums on the minuscule Big Mo label. Their only major label release ever, a 1980 self-titled affair on Mercury, has long been out of print. So if you want to get to know this band, you should try to get this better-than-average outing before it too vanishes from the record bins. Sweet Daddy Cool Breeze is a Massachusetts band that features the singing and harmonica playing of Wally "Sweet Daddy" Greaney. The band was entered in this year's International Blues Challenge, which took place in February. Though Greaney dedicates his latest album, the independently produced Blowin' Down the House, to his two idols James Cotton and Paul Butterfield, the music of SDCB shows more than a hint of a West Coast influence. Accordingly, the band covers two Rod Piazza tunes here, with Kim Wilson and Sonny Boy Williamson II also getting this type of absolute homage, along with Albert and Freddie King. Greaney is as effective a singer as he is a harpist. His voice is smooth and expressive, though with a limited range, while his harmonica playing often strives for the less-is-more approach. Sometimes, as in "Evil" (not the Howlin' Wolf classic, but a minor Muddy Waters composition), he gets pretty damn close to perfection. Other times, he is almost overshadowed by the other featured soloist in the band, inventive guitarist Mark Easton. Only in the opening and closing tracks does Greaney really pull out all the stops and show that he too can take your breath away with his pyrotechnics. The album was recorded live at Theodore's Night Club in Springfield, and it showcases Greaney as he works the crowd. On two occasions he gets the attendees to sing with him on a call-and-response type of chorus. The four original songs (one of which is written and sung by guitarist Easton) are strong enough that the band has chosen to play them towards the end, leading up to the show-stopping rendition of Sonny Boy Williamson's "Cross My Heart." Sweet Daddy Cool Breeze are among the top unsigned blues bands in the country. Blowin' Down The House will bring you nothing but a good time. You can check the band's touring schedule and find its CDs at http://come.to/sweetdaddy. Somewhere between Rick Estrin and The Blues Brothers, singing in French with a thick Quebec slang, Urgel Boogie (a pun on the name of a well-known mortician) is living proof that you can indeed sing the blues in French and make them sound like a living, breathing form of expression. His first album, Ah! Les Femmes (translation: Ah! Women! ), distributed by Bros (www.bros.ca), is full of quirky humor, funny references to Quebec icons, faux-kitsch vocals and lots of great guitar licks (some mean B-3 and piano too). Urgel (real name: Martin Malo) is strictly a lyricist, albeit a witty one, and he loves the blues. With guitarist Louis Janelle composing all the music (save for one track) and doing a great job of fleshing out these jump blues/rock and roll vehicles for Malo's observations, and with keyboard whiz Bernard Quessy infusing everything with some soul, you can probably enjoy this CD even if you don't get what it's about. But then again, maybe it will prove to be the incentive you needed all along to go and learn a foreign language. A quick note to end this month's survey of bluesworthy records ... Jeff Beck, he of the Yardbirds and countless other projects ever since, has released a new album, called You Had it Coming (Epic). Nine of the ten cuts are original and instrumental compositions, featuring plenty of his guitar prowess, atop layers of drum machine beats, with other trendy sound effects (including generalized use of loops to generate rhythm tracks). The one cover on the album is a drum and bass version of Muddy Waters' "Rollin' and Tumblin'," sung by silky-voiced Imogen Heap. Beck gives it a strange military march feel, perhaps in keeping with his machine gun solos. Muddy must be spinning in his grave. 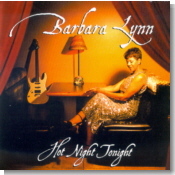 I have always admired Barbara Lynn and have listened to many of her recordings over the years. I even purchased You'll Lose A Good Thing when it came out in 1962. Oh my god!! That was almost 40 years ago. I just never felt that she made a record that satisfied throughout --- until now. Hot Night Tonight (Antone's) is a prime example of R&B at it's finest. It's not really blues, but a collection of soul and R&B that could have come from the golden era of Stax or Hi Records. Sam and Dave's "When Something Is Wrong With My Baby" and Eddie Floyd's "I've Never Found A Man (Girl)" are two from that era that give the originals a run for their money. Lynn's own "Hear From My Daddy" and the wonderful "I Let a Good Man Go" would not have been out of place on a 1970s Ann Peebles album. The timely and topical "Don't Hit Me No More" is one of the album's highlights. Tell it like it is, girl! Only the modern hip hop track, "You're The Man," seems out of place here. But Lynn's son Bachelor Wise does such a fine Rap vocal, and the tune is so catchy, that I thought this track added a nice dimension to the album. Although too late to make my top ten of last year, it's not too late to pick up a copy and appreciate the talent of Barbara Lynn. Imagine my surprise the other day, while flipping through a stack of CDs at a local music store, when I stumbled on another release by Eddie Cotton that preceded his Live at the Alamo Theatre CD that I reviewed last year for Blues Bytes. 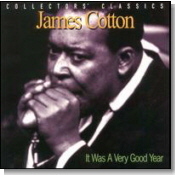 Turns out that Cotton recorded a CD in a home studio in Madison, MS in 1998 with his band, as the Mississippi Cotton Club. That release, You're The Girl, displays more of the talents that Cotton revealed in his live CD. All ten songs are Cotton originals (three of which, "Why Must I Cry," "Don't Give Up On a Love Affair" and the title cut, also appear on the Alamo CD) and there's not a bad song in the bunch. The songs touch on soul, gospel, jazz, and even funk elements while remaining rooted in the blues, and show that, as a composer, Cotton is mature beyond his years. In addition to writing all songs, Cotton plays lead and rhythm guitar and arranged and produced the CD. The band is solid in support of Cotton's soul-drenched vocals and versatile guitar. Considering this CD was a home studio effort, the production is very good. This CD can be purchased locally in Jackson, MS or on the Internet at www.proteus2.com. Also, look for Cotton, starring as Robert Johnson, in the short film, "Stop Breaking Down" (details at www.marzanofilms.com). Trust me when I tell you that you will be hearing much more from Eddie Cotton in the future. Larry McCray is the epitome of the modern blues artists, influenced as much by the Allman Brothers as by Albert King. His previous albums have successfully blended blues and rock influences into a cohesive whole, remaining blues-based with a rock edge. McCray's most recent release, Believe It (Magnolia Records, distributed by Shodown Records), continues that tradition, but this effort leans a lot closer to rock than his previous efforts. McCray's guitar is right up front and he really rips it up, even more so than on his previous CDs. It sounds like this was his last chance to ever pick up a guitar and he wanted to make it memorable. He does. Vocally, this is McCray's strongest effort yet, as he sings with passion and power (just like he plays guitar). The song selection (five were co-written by McCray) is as good as the songs from McCray's exceptional Born to Play the Blues from 1998. Highlights include "Blues Is My Business," "Burglar," the funky "Best in Town" (co-written by Teenie Hodges), "She's a Wolf," and "Best Friend." McCray reveals a softer side on the title cut and the opening cut, "That's How Strong." The band is first-rate, featuring McCray's brother Steve McCray (who shares composer credits with Larry) and bassist Noel Neal, and offer solid support, as they have on McCray's previous releases. The CD, which was recorded in Chicago and Memphis, boasts strong production by Mike Vernon. McCray reportedly wanted more production input on this CD, which is why he released it himself on his website last summer (www.larrymccray.com), before it was picked up recently for wider distribution. McCray has put out consistently good CDs. But this is probably his best overall effort yet, and should win him some new fans. Fans of pure blues may be turned off by the rock edge, but give it a try and you may be surprised at the blues that lies underneath.